a thoughtful blog: Greetings from Texas! I have an oversized Texas coffee table book that I have been holding onto, eyeing the glossy two-page spreads for possible envelope making. But a couple of weeks ago, probably because postcards were already on my mind, I got the idea to make some of the smaller photographs from the book into my own "travel" postcards. When I saw this picture of an old post office in Luckenbach, Texas, (Waylon and Willie and the boys not pictured*) I thought it would be the perfect thing to send to my friend Melissa. The photo I took with my iPhone is a little dull and grainy, but maybe you get the idea (I put a gold star next to the "U.S. Post Office" sign). The picture itself actually looks pretty outdated**, but I think that is sometimes the fun of postcards--they can be a little cheesy. The coffee table book lends itself well to being cut up into postcards because it has those captions describing the picture just like a travel postcard would. I cut out the caption and glued it onto the back of the chipboard. 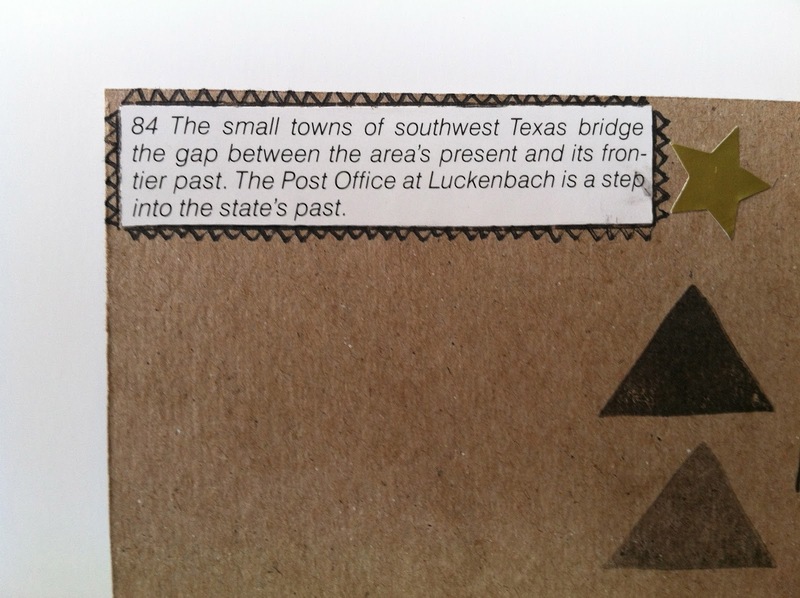 *I couldn't get "Luckenbach, Texas" out of my head while I was making this . . . "maybe it's time we got back to the basics of love". . . I love that song. 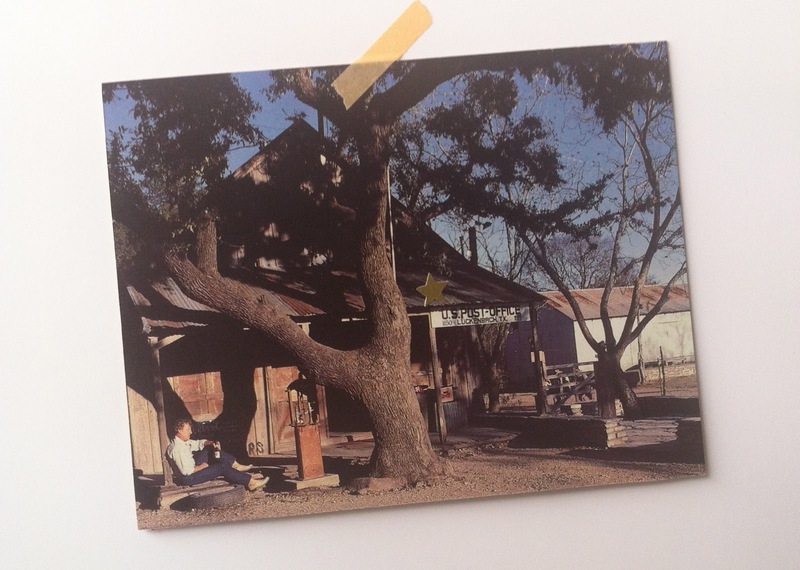 **Google "Luckenbach Texas Post Office" to see more recent/well-lit pics of the P.O. (which does not appear to have changed a bit since the coffee table book was published in 1990). Serendipitously, your lovely card arrived today in perfect condition! Thank you so much!